Former Maharashtra deputy chief minister Chhagan Bhujbal was arrested on Monday evening by Enforcement Directorate (ED) in connection with the money laundering cases lodged against him. He war arrested after being questioned for more than 9 hours today by a team of ED officials. The senior NCP leader, accompanied by MLC Jitendra Awhad, arrived at the ED office at Ballard Pier in South Mumbai amid tight security around 11.30 AM. A large number of party workers who had gathered outside the ED office raised slogans even as prohibitory orders were put in place to avoid any untoward incident. The agency recorded his statement in the case under the provisions of the Prevention of Money Laundering Act (PMLA). The ED had registered a PMLA case involving the Bhujbals and some of their associates and has already arrested the ex-minister's nephew Samir last month in the case. Samir is currently lodged in the high security Arthur Road jail here. The ED had also questioned Bhujbal's son Pankaj in the same case last month. The agency has filed two FIRs against the Bhujbals and others under the provisions of PMLA, based on Mumbai Police FIRs, to probe the Delhi-based Maharashtra Sadan construction scam and the Kalina land grabbing case. 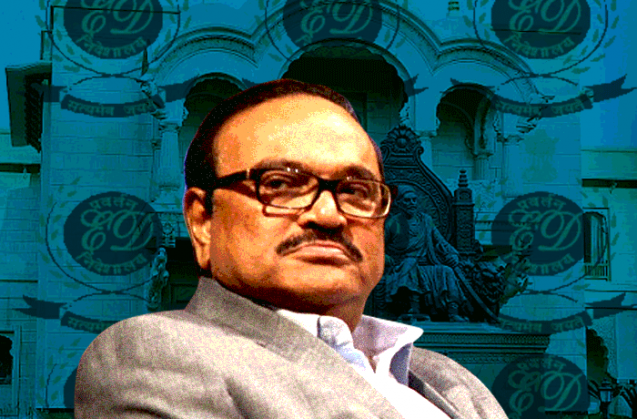 Read More: Will things ever be the same again for Chhagan Bhujbal? It had also brought out orders for attachment of three properties with an estimated worth of over Rs 280 crore in the case under money laundering laws. ED had twice conducted searches at nine premises, including properties and offices, belonging to the senior Bhujbal, Pankaj, Samir and few others. NCP had then described the searches as "political vendetta". The state Anti-Corruption Bureau has already filed a charge sheet against Chhagan Bhujbal, Pankaj, Sameer and 14 others in the Maharashtra Sadan scam case. The new Maharashtra Sadan was built at the cost of Rs 100 crore when Congress-NCP coalition was in power in Maharashtra. The ED had summoned Bhujbal on March 8 following a complaint by Bharatiya Janata Party MP Kirit Somaiya in connection with cases lodged under the Prevention of Money Laundering Act and Foreign Exchange Management Act pertaining to alleged irregularities in the construction of a new 'Maharashtra Sadan' in New Delhi, worth several hundred crores of rupees. Read More: Are the BJP and the NCP playing a fixed match in Maharashtra? The ED had on February 1 arrested Bhujbal's nephew Sameer Bhujbal. Later last month, it questioned Bhujbal's son Pankaj Bhujbal, a legislator.